OVERALL: Our Bosch B22CS30SNS refrigerator review easily shows why this is a popular model with many consumers. 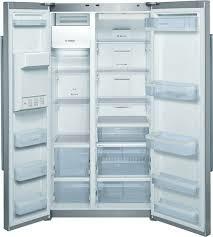 It is BY FAR one of the more style side by side refrigerators we ever included in our Refrigerator Reviews section. Bosch has really taken the appliance world by storm creating some of the more innovate refrigerator models. If you purchase more than one Bosch appliance (such as a Bosch dishwasher or Bosch wine refrigerator), you might be eligible for a rebate -- up to 10% off in some cases! As we mentioned the styling is really the standout thing to mention. With it's Frameless Exterior Ice and Water Dispenser with LED illumination it gives the front face a sleek, modern look that most side by side refrigerators just can't compete with. It has the usual features like Spill proof glass shelves and fully extendable freezer drawers at a 90 degree door opening angle. This Bosch B22CS30SNS has excellent performance ratings. The Dual Evaporator keeps the air-flows and aromas separate between the fridge and the freezer and has the exclusive Multi-Flow Shower Cooling System™ which enhances performance through uniform cold air circulation. You don't need a box of baking soda with this fridge as it also has the AirFresh carbon filter which helps to reduce unwanted odors and the unique AntiBacterial wall linings provide a hygienic interior. There's plenty of space in this Bosch B22CS30SNS side by side refrigerator. Surprisingly, the ice/water dispenser was well hidden within the interior to maximize your storage space. It's also ENERGY STAR qualified which means that you'll not only save money on energy costs, but you'll be helping the environment. CONS: It's a counter depth fridge which helps to give it a 'built-in' look, but unfortunately it sacrifices a bit of space. Although it's just as wide, unfortunately, it's not as deep as other side by side models we've reviewed.